The 2019 Art and Dance Project was a major success in ways that we never could have predicted! It was a week of school vacation for the children of the Guillermo Garzon Ubidia middle school (and our first time working in the middle school campus, with 4th through 7th graders). 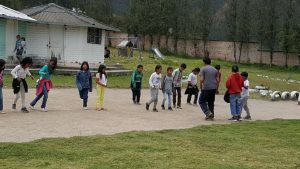 We weren’t sure if the children would come to school, but our fears were allayed completely when on the 1st day there were 85 children in attendance. We continued to have excellent attendance throughout the entire week. On 2 days of that week, 10 preschoolers attended with their brothers, sisters and cousins and they participated in the art and dance classes with complete joy and delight. Check out this great video of Rachel with the kids! both the children and the teachers. Wendy, our art education director, attended and taught for the 3rd time. This time she taught with Elaine, who also teaches in the NYC school system, though not in the same school or classroom. 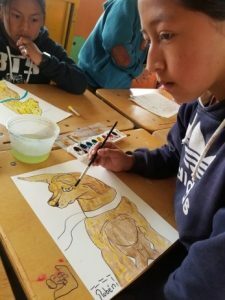 They worked with the natural artistic fluidity that students presented around their own symbols, culture and environment and encouraged confidence and creativity. It resulted in the experience of joy, collaboration, expression, discovery and art work that was spectacular. 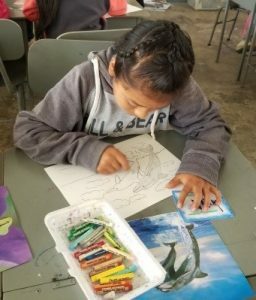 Their students spent the week working on drawing and watercolor techniques. They focused on lines, shapes and color. They drew with markers, then added watercolor and accents with oil pastels. 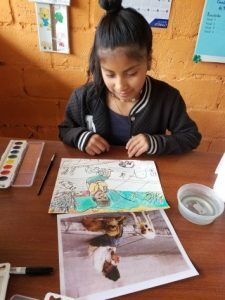 Students used photos of local dogs and llamas as their subject matter to create a bridge between both projects in eaglyYcondor.org. 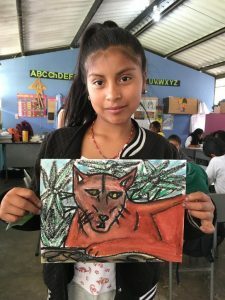 The students enjoyed the process of developing a finished painting, while learning to observe the shapes and colors in photos and using their own imaginative capacities to capture the spirit of these animals. In the beginning, these teachers came with art supplies, experience and energy and left with full hearts and invaluable lessons that they imparted to the children. The artwork tells the story. This year 2 new teachers attended for the week, allowing for 2 simultaneous art classes to occur. 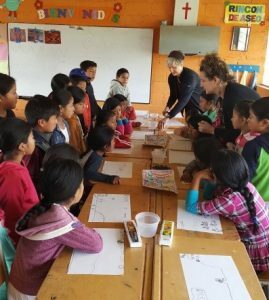 Nora, a Vermont art teacher and Ruth, the former Director of art education at the Michener Museum in Bucks County, Pa worked together to provide multi-media art exposure to the children at the middle school. They worked with joy and enthusiasm as if they had worked together for a lifetime. 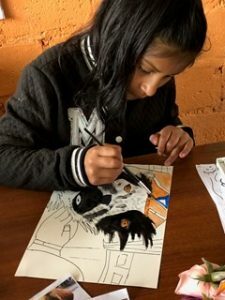 They provided the mixed mediums of water pastels, oil pastels, watercolor, sharpie markers and pencils to create mandalas, animal portraits, and abstract shape designs. 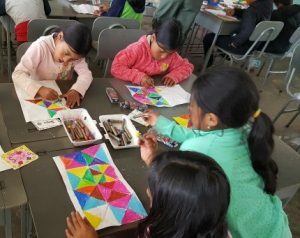 They also used cut paper strips and wire to create unique paper weavings, in a manner similar to the works that are prolific in the markets of Otavalo. Their classroom provided students with new and interesting opportunities to experiment with materials and designs while expressing individuality and creativity. 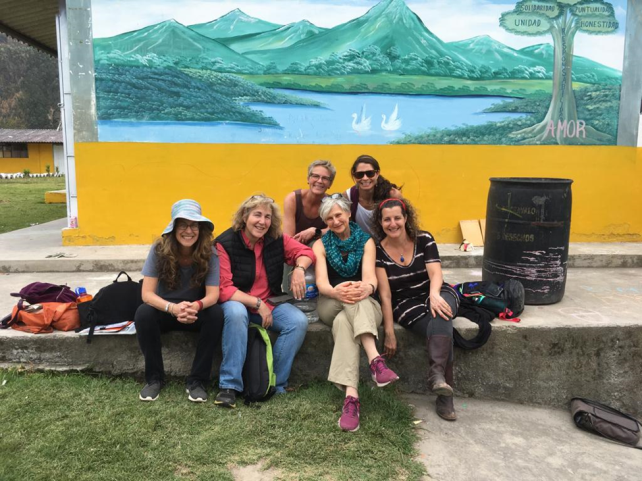 These teachers came with excitement and enthusiasm and left with a love for the children, their culture, the Ecuadorian landscape and the mission of eagleYcondor in their hearts and minds. The children were sad to see all these teachers leave. 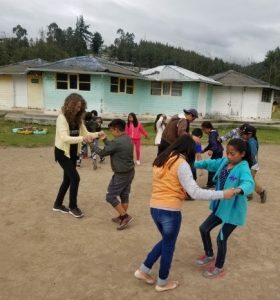 In addition to the 2 art classes, this year we invited Angel, an Ecuadorian actor, dancer and photographer to teach Latin dance to the children. It was his 1st experience working with children this young, but you never would have known that by watching him. He worked through the children’s shyness and self-consciousness, ultimately making his class a favorite of all the children in the school. At the end of the week, all the children felt a comfort and fluidity in the movement of salsa, merengue, cumbia and reggaeton. During recess there were dance parties where children shared their street knowledge of the popular dances and an embrace of their talent and ease of movement. 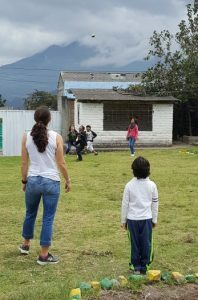 He was joyful in his approach and in the end of the week the children were looking forward to more opportunities to show their new found dance styles to others. The result of this year’s project could not have been more successful. 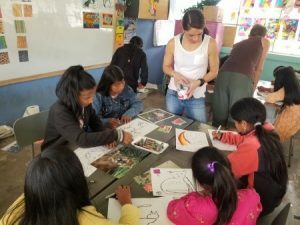 We introduced new art and dance forms, provided opportunities for creativity and self-discovery and allowed the children to make new connections with teachers who wish to return to offer them more exposure to creative outlets for self-expression. We are never sure what the next year will bring, but we know that we are welcomed and received with open arms and hearts. It is a project that offers and provides joy for all involved. FOR THAT, WE ARE FOREVER GRATEFUL. We were asked to bring computers to furnish a classroom for the children to work with and learn about computers. Though upon arrival, we realized that the classroom was filled with working computers, but there was no computer teacher to instruct the children in their use. So we decided to give 5 teachers in the middle school a laptop computer each, for the purpose of uploading lessons and managing their own classroom curriculum material. They were very pleased with the opportunity to have computers in their classrooms and have continued to send photos of the classwork that they now can do in their rooms with the computers provided. It was a great fit for the donations provided. We were informed of and introduced to the newly appointed Mayor of Mojanda. There was a request made for a computer to enable him to bring the new administration into the current era, by providing computer access and connection. 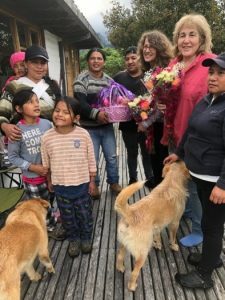 Nancy and I donated a new computer to the new administration and for this we were shown great appreciation ,receiving 2 bouquets of flowers and a huge basket of fruit, from which all the volunteers of both projects feasted upon for the next 2 weeks. We have become aware of the hardship that some families have of putting their children through secondary school (high school, Colegio). This was brought to our attention in the case of Jenny, who revealed that she would not be able to attend high school because she would need to stay home to help her mother with her younger siblings. We met with Jenny’s mother to ask what she would need to allow Jenny to attend secondary school. She expressed that the costs of uniforms, books and transportation are too onerous for her to bear and if she could be helped with those costs on an ongoing basis, she would send Jenny to high school (the first child of hers that would have that opportunity). 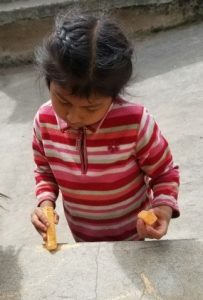 We offered to pay for those costs (approximately $300 yearly), provide a computer for her school work and make sure that someone would continue to visit and make sure that the family could continue to meet their needs while allowing Jenny to complete her high school education. Our wonderful board member, Jorge and Angel, the dance teacher, have graciously volunteered to follow up with this family and assist in providing the money and material provisions that would enable this family to maintain their promise to allow Jenny to continue her education. Jenny is a very special and talented child who can achieve many things if she is given the opportunity to pursue them. We are very committed to enabling children that we have worked with to have experiences that could open their worlds and offer opportunities for growth and success. 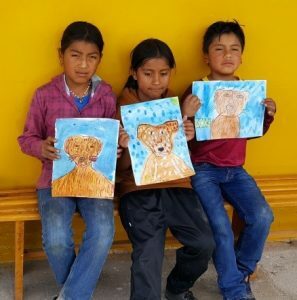 It is for that reason that we are considering the development of a sponsorship program to help ensure that these beautiful children get a fighting chance to become the best people they can be with exposure to opportunities for educational and artistic development and growth. Please consider sponsoring a child in need of educational support!